The distance from Halong Bay to Ninh Binh is about 300km , it takes 4.5 hours to get there. - 12.30: Our guide and car pick you up at the hotel in the Tuan Chau island or Hon Gai island then takes 4,5 hours to Ninh Binh. On the way, we have 1 time for shortbreaks for bathroom. You also can find you some snacks for breakfast there on your own. - After 4,5 hours : Arrived Ninh Binh, get droped of here, journey finishes. Included: English speaking guide, bus ticket from Halong bay to Ninh Binh. Tuan Chau island - Hai Phong city (shortbreak) – Thai Binh province – Nam Dinh province – Ninh Binh (last stop). 5.15 - 5.30: Our bus driver will pick you up from Hoa Do intersection in Ninh Binh city center (all taxi drivers know this place). It takes about 4 hours to get to Halong city including 1-2 stops for a short break and bathroom. You will arrive in Halong city around 9.30 am. This bus will drop you at Tuan Chau gate where is about 4km to get to the harbour. 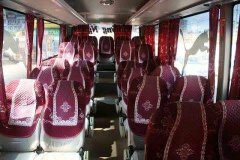 6.30: we pick you up at hotel in Ninh Binh/ Tam Coc then you get on seatting bus heading to Tuan Chau harbour. It is 4.5 hours from Ninh Binh to Halong bay including 1 stop on the way for stretching your legs and bathroom. You will arrive in Halong Bay after 4.5 hours, this bus will drop you at Tuan Chau harbour on Tuan Chau island. Finish your bus journey. Hotel in Ninh Binh – Nam Dinh province – Thai Binh province – Hai Phong city (short break) – Tuan Chau island (last stop). Here is the answer that all travellers want to know: There are 5 different ways to get to Ninh Binh from Halong bay. You can rent motorbike in any travel agencies in Halong bay to slowly driving to Ninh Binh city and back . For a good quality for roads motorbike, it costs about 10 USD per day which can be for 2 people sit on. You should drive slowly to enjoy landscapes and stop for photos shooting on the way. !!! Warning: You should be carefully before renting because roads From Halong bay to Ninh Binh are very dangerous with traffic jam.